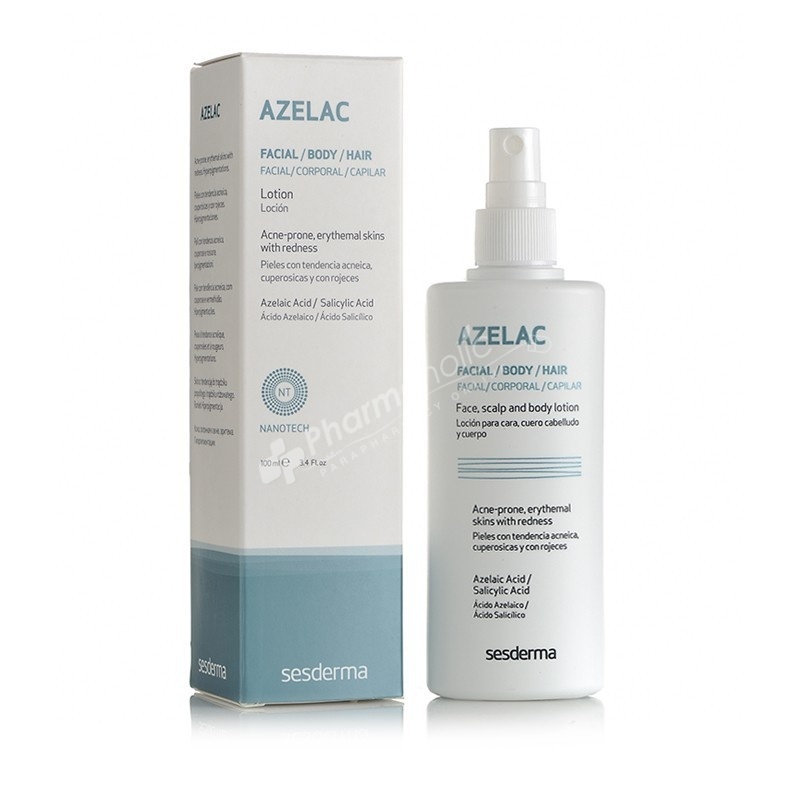 Sesderma Azelac Lotion used for prevention and treatment of oily and acne-prone skin. Recommended in cases of difficult beards and problems related to shaving or waxing. It can be applied on the face, body and scalp. We Ship To United States. Prevention and treatment of oily and acne-prone skin. Recommended in cases of difficult beards and problems related to shaving or waxing. It can be applied on the face, body and scalp. Recommended use on skin with rosacea, redness and couperosis. May help reduces facial flushing and redness. For acne and acne-prone skin. Folliculitis by shaving or waxing. Very effective due to its content of salicylic acid (2%), which has an important comedolytic, bacteriostatic, fungistatic, sebostatic, keratolytic and soothing action. The action of salicylic acid is enhanced by azelaic acid (5%), the bacteriostatic, anti-irritant and sebumregulator helps to treat and improve the appearance of oily and acne-prone skin. Alcohol Denat, Aqua (Water) Propylene Glycol, Azelaic Acid, Salicylic Acid, PEG/PPG-20/6 Dimethicone. © 2018 Pharmaholic. All Rights Reserved.